I have chosen to look at a not well-known Microcap stock (Cap: $18 million) Traffic Technologies which started trading in 2004, and listed on the Australian Stock Exchange in 2005 with the Code TTI. A friend and fellow contributor to the Traders’ website TenBagsFull suggested it to me. At this moment I have no shares in TTI. This post presents the results of my limited research, for the information and interest of readers. I am not a qualified financial adviser so I make no recommendation myself. Interested readers should do their own research, and seek independent advice as needed. It manufactures and supplies technical products such as traffic lights and controllers, portable roadside technology, variable message signs, emergency telephones, and road lighting. Its other division is the Signage Division. It supplies traffic signs and traffic control products to road traffic authorities, councils and the construction industry. Operations: The head office is in Eltham, Victoria. There are regional plants and offices in all Australian states together with distribution offices in New Zealand, Asia, North and South America, and in Europe. Two leading fund managers specializing in Microcap stocks are substantial shareholders with significant positions, announced 5/12/2013. Contango Asset Management has 16,327,924 shares with 5.93% of the vote. Acorn Investments increased its shareholding from 16,293,106 to 37,500,000 or 13.61% of the vote. Revenue declined 25% to $19.926 million. These declines were attributed to expenditure cutbacks by State governments, a slower start to the NSW signals upgrade contract, and uncertainty surrounding the federal election. This weekly chart of Traffic Technologies Limited shows two tops, a year apart, at about 9 cents, which might be considered to herald a change in trend. Whilst the second high was lower, the next low was higher than the previous low, indicating that the primary uptrend of the past two years is still intact. A fall of the share price below support at 5.5 cents would however strengthen concerns about a possible further pull-back. a down-trend. Assuming that the share-price is likely to resume upward gains, the next target is the resistance level at 9 cents. The last few months the share-price stagnated in a range between 6 and 7 cents. 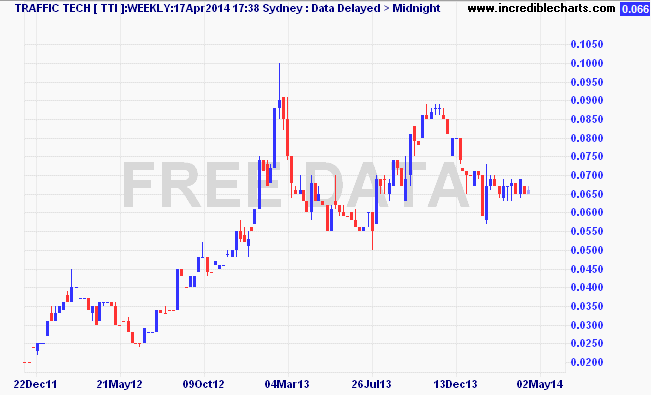 One would expect there would be a break-out above 7 cents first. Traffic technologies is a dominant player, with a niche and growing market, supplying essential, complex traffic equipment to international and local customers. The operation is small by any standard, but it is profitable with steady, if somewhat variable revenue. The Directors have significant stakes in the company, and enjoy the support of the two largest microcap fund managers, Contango and Acorn. With infrastructure a major plank in Coalition plans for economic growth, it would seem likely that TTI will be a growing one, able to provide a stream of franked dividends for shareholders. I am not a shareholder, but on the basis of my review, I think it is one which meets my risk criteria, and is suitable for a medium to long-term investment horizon. My plan would be to buy on break-out above 7 cents with my first target at 9 cents. I would have at least a mental stop/loss position at 5 cents. ‹ How much will you need to save for your retirement?